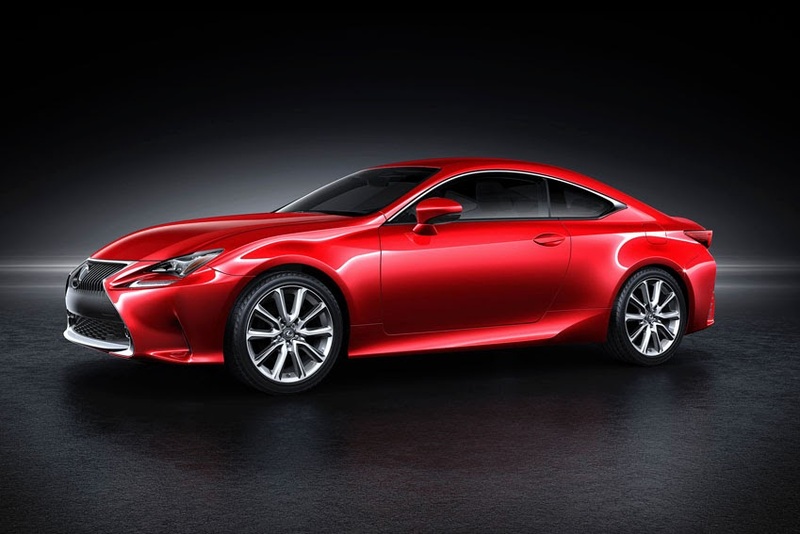 "Our focus is to strengthen the brand's emotional appeal through our products and RC is another demonstration of this focus," said Mark Templin, Lexus International Executive Vice-President. "The emotional attachment of a coupe is found in its purity of design and its engaging driving experience, and with RC the engineers have achieved the balance." "We developed RC to deliver extra response that exhilarates rather than overwhelms drivers, in keeping with the true spirit of Japanese hospitality, or omotenashi.," added Junichi Furuyama, RC and IS Chief Engineer. The RC has been infused with deeply contoured lines, integrating the widest and lowest application yet of the Lexus spindle grille. It is unique in the Lexus range - 1.2-inches wider, 1.4-inches lower and 2.8-inches shorter in wheelbase than the new IS sedan, providing a road stance that emphasizes the attraction of a luxury two-door vehicle. The unique headlamp design adopts the symbolic Lexus L-shaped motif front and rear. There are two choices of aluminum wheels - a deeply sculpted 10-spoke 19-inch and a muscular five-spoke 18-inch. A purpose-built Lexus-first lighting package provides a great sense of occasion, with illumination that reflects upwards, rather than downwards, to envelop the cabin. High contrast interior colors emphasize design lines and accentuate the elegant cabin. Genuine shimamoku wood highlights - the result of an intense, layered wood production technique refined by Lexus - are used to emphasize the surrounding trim. The driver's cockpit is divided into operational and display zones. The upper zone houses the instrument panel and a seven-inch navigation screen while a layered center console integrates a new Lexus-first Remote Touch Interface. The RC's strong and purpose-built chassis is the latest evolution of Lexus' objective to achieve a world-class driving experience, epitomized by the improved performance of both the GS and IS lines. Extra thick underbody rocker panels greatly increase the two-door's rigidity to support driving performance. New manufacturing techniques pioneered in the LS and IS models, including the use of body adhesives, have strengthened the chassis. The dual injection 3.5-liter V6 gas engine produces maximum power of 314 hp at 6,400 rpm, and peak torque of 280 lb ft at 4,800 rpm. The hybrid variant - the first Lexus hybrid coupe - uses a dual-injected 2.5-liter four cylinder engine with a 105 kw electric motor driven through an electronic continuously variable transmission with six step gears in a sequential shift-matic feature.